Composed by Darian Stavans. 21st Century, Contemporary Classical, Post-Romantic, Post-Modern, Repertoire. Score. 38 pages. Published by Musicgramma (S0.520989). Música Nocturna - Piano Music / Album "Música Nocturna" by Darian Stavans. 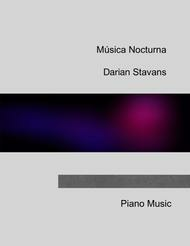 Nocturnal Music is a poetic musical narrative of the landscape of events that occur at night. It begins with the dimming of the heavens that fall silent giving way to the echoes of the night. We all have images of a brightly lit moon underlined by veils of clouds. We all treasure impressions of the night and the sea immersed in a dialog with the stars. We all pray through the forces of the night. Love and passion meet and merge under its best scenarios. Then, just before dawn, we fall into the deepest essence of the soul of the night as it slowly ends with the distant tapping of light emerging into a brilliant sky. Birds announce the end of the night bringing a halt to the forcefulness of another journey into the wondrous miracle of the night world, the most pristine view of the incredible force of nature.